Quiet Life bring the noise to Casbah on Saturday. “Hang on, I gotta put the phone down. There’s a cop up here,” Sean W. Spellman says to me as he drives across Iowa on a national tour that’ll eventually bring him and Quiet Life to the Casbah, where they open for Pokey LaFarge on Saturday, July 25. It took us some work to connect. A missed call, returned a week later, rescheduled, then put off another hour because Spellman had taken the wheel just as my call and highway patrol converged on him. (Tour life, amiright?) But once I finally got Spellman on the line to talk about Quiet Life, it became clear quickly that these guys, despite their name, aren’t going to keep quiet for long. It’s hard to capture genre-bouncing Quiet Life -- they lived in Portland, Oregon, for four years, using it as their base. But they’re all from the East Coast. And now they’re scattered, coming together to tour and to record. 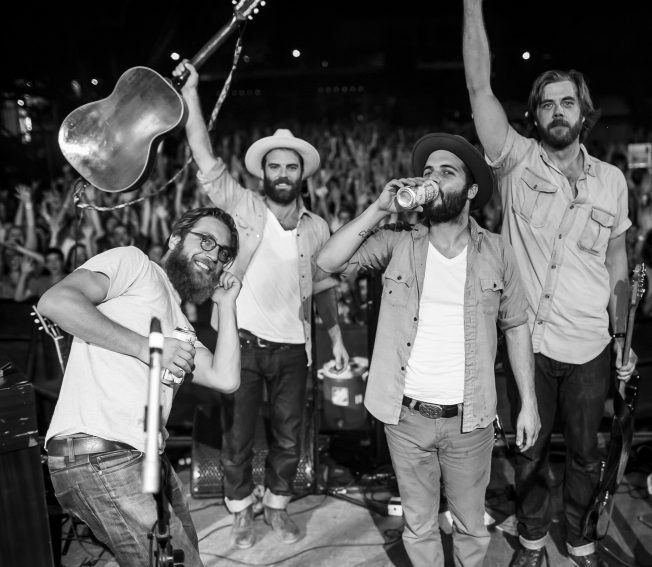 Yet their sound is distinctly Southern, classically, with one heavy foot in indie and the other in roots rock. It borrows from Americana in the sort of warm but genuine way that makes Newport Folk Festival worthwhile year after year. It carries with it the kind of personality that husband-wife duo Michael Trent and Cary Ann Hearst use to mesmerize crowds as Shovels & Rope -- which maybe shouldn’t be surprising given the connection the two groups share. A fan of Shovels & Rope himself, Spellman got Hearst to loan her vocals to the title track off Quiet Life’s 2014 EP, “Housebroken Man.” Was it chance -- one of those collaborations dreamed up by management or record labels? No. That EP, though only five tracks deep, carries another heavy collaboration: Jim James (of My Morning Jacket and general musical fame). The song -- a cover of Townes Van Zandts’ “Waiting Around to Die” -- is beautiful and rolling, deep with valleys that just sound like Jim James without being Jim James. But how the hell did you get Jim James? But that was 2014, and now the guys have a new record coming out, likely this winter. Dr. Dog lead guitarist (and the Spellmans’ cousin) Scott McMicken produced the album, which they recorded around this time last year in Philadelphia. “It was a sweaty experience,” Spellman says. “It was almost a year ago, super hot, super humid. There was no AC, and we were living there -- Dr. Dog has this awesome warehouse.” He wrote most of the record while living by the beach, so “it’s very influenced by the energy and happiness of summertime. It’s different than our last records, less country. It’s just a little different, that’s the broadest way to say it,” he says. Part of what’s different is the way that the band, which with Sean and Ryan includes Philippe Bronchtein and Thor Jensen, approached the studio. Spellman usually writes the songs, he says, and the band has them for a while before getting into the studio. This time, however, the first time that the band heard all but two of the new songs was in the studio. That’s where Quiet Life worked out the kinks and massaged the music -- and the excitement and energy of playing it fresh -- into an album. Summery San Diego is an ideal spot to debut some of that new material before the album drops, as Spellman very well knows. He spent three weeks here last summer, living with friends in North County. “Oh, I’m very familiar with San Diego beaches,” he says. “I love Leucadia, Encinitas, all that up there.” The dude spent mornings at Cafe Ipe and for years had friends who worked at Cardiff’s Besta-Wan. He’s basically a local -- or was for a few weeks anyhow -- so when he and Quiet Life come through town on Saturday, turn on that San Diego charm and welcome them like they’re one of us. We just might be able to convince them to stay and enjoy the quiet life. Quiet Life open at the Casbah on Saturday, July 25, at 8:30 p.m. Pokey LaFarge headlines. Get tickets here.